Modern Villa with Private Pool and the sea on your doorstep. Our luxurious 3 bedroom (newly refurbished inside and out), with private pool, and a secluded beach on your doorstep. The picturesque village of Pervolia is within strolling distance of all local amenities/facilities are to hand. This comfortable, modern and elegantly furnished villa is situated in a securely gated complex with private car parking, has 2 double bedrooms (1 with en suite), both rooms enjoying balcony terraces, a family bathroom and downstairs shower room. Downstairs comprises an open plan Lounge, Dining area and fully fitted kitchen. There is air-conditioning throughout, TV/DVD. Outside features a swimming pool (sun all day), large patio areas, a dining area, table, chairs, sun loungers and parasol. The perfect villa, with all the mod cons, swimming pool and the sea on your doorstep. A relaxing holiday for all. En-suite bathroom to bedroom 1 with shower and wc. Bathroom with bath/shower and wc. Shower room downstairs with wc. The bright, open plan living area has a 2 and 3 seater leather sofa and Television.This leads to a dining area with table and seating for 8 people, plus high chair, then into the fully fitted kitchen area with all modern appliances. The kitchen is fully fitted with all modern appliances including integrated cooker, hob, fridge/freezer, washing machine, dishwasher and microwave. Standard Tv, New future addition. Temp. Out of service, New future addition. Notes on accommodation: All rooms have a dual air-conditioning/heating system to achieve the perfect temperature. Blackout blinds are fitted to keep the rooms cool in the heat of the day and to ensure a good nights sleep. Strictly No smoking is permitted in the villa at any time. Outside smoking is down to occupants to discard cigarette butts. Outside: The outside space of the villa is designed with your comfort, enjoyment and safety in mind, with its own private walled garden, private parking and gated access on a small gated development. The majority of the garden is paved, but has a pleasant mixture of tropical plants to create a truly relaxing setting. The main feature of the garden is the private swimming pool to splash away the days in the sunshine. We strongly advise No Sun OIL in the pool as this can damage the pool filter and pump. If you prefer to relax whilst keeping a keen eye on the children, there are 4 sun loungers, patio table, 6 chairs, parasol - plus of course a BBQ so you can enjoy alfresco dining. (BBQ to be cleaned after use by occupants). Cleaning / Towels / Linen / Maid service: Towels and linen are included in the price. The property will be cleaned before arrival. Please bring your own beach towels. beach is few mins away . Thank you. Great little quiet tranquil break,close to the sea. Privacy of own pool. Lovely and clean,No Wifi but plenty of places nearby with WiFi. Management team very helpful and informative. Local bars,tavernas and beach within walking distance. Thanks for late check out. Would love to come back and stay! The villa was not clean inside (cobwebs) or out,my family and I spent 2-3 hours cleaning it after purchasing new clean mop and broom!! The air con in the front room/kitchen was broken for the first 8 days which was a horrible start to our holiday. The swimming pool was dirty and it took 10 days for the maintenance person to sort out!! Would not recommend anyone to stay here as the owner is not at all sympathetic about the issues. Most of the sunbeds outside were broken so we did not use the pool very often therefore wasted my money renting a villa with a pool. In response to the guests prejudice review, I would like to reassure all future guests that the villa is always cleaned thoroughly and all bedding and towels are laundered and beds freshly made on the day of your arrival. The pool and pump have recently been refurbished and the pool was proven to the guests to be 100 % clean and chemically safe from the outset. A new air conditioning unit was fitted downstairs which unfortunately took a little time to arrange, but now works perfectly as do all of the other units in the villa, cooling or warming the villa throughout. 4 of the 6 sunbeds are brand new and the other 2 sunbeds are more than serviceable; unsure why the guests claimed most of them were broken? I can’t understand why any derogatory comments have been made about the way I handled the alleged problems, when I was totally sympathetic and acted promptly to address the many unjustified complaints from this guest and together with our trusted management agents we worked tirelessly to manage the guests and the problems they perceived professionally and effectively: In the 11 years of owning and renting the villa, I have just experienced a professional complainer with a sole goal to claim money back, but never once asked to be relocated! 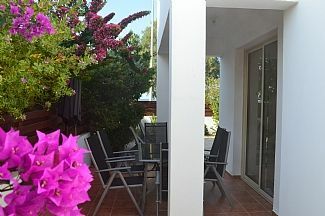 Probably due to the villa being excellent value for money and the fact that it is located in an outstanding location for the relaxing holiday you need. downstairs air cons didn't work got a replacement fan..
We had a lovely time, it was very spacious, the directions from the airport to the villa was very helpful. no far from Larnaca and other beaches. Will definitely recommend the property to a friend. Could do with a good scrub and update,the damp definitely needs sorting out. The Villa was in a reasonably quiet area although the road at the back of the property was busy and frequently used as a racing track.We had a problem with the electricity supply on arrival as in,there wasn't any! After numerous phone calls and awaiting calls back from Owners direct which never came we had no choice but to stay in the Villa overnight with no electricity,to cut a very long story slightly shorter an electrician was called and sorted out what turned out to be quite a nasty problem! The Villa was cleanish i.e. The bathrooms,toilets and sheets were clean but it didn't look as if the furniture had been moved for sometime and the kitchen cupboards had not been emptied and were full of other people's opened food .The BBQ we didn't use as it didn't appear to have a grill and had not been cleaned out, despite a notice asking guests to do so.A car is definitely a necessity as the area is not within walking distance of a shop/supermarket however there was a lovely restaurant a short walk away.The beach nearby was ok but we preferred to drive into Larnaka and use the beach there.Despite the problems at the beginning of our holiday we did enjoy our stay in Cyprus. The villa is great- with a pool and a good location for us. Has all the facilities you need. However, it feels like it need some investment and regular maintenance is required. - Natalie, the contact was very helpful but it required investment and she needed to contact the owner- we spent the second week without downstairs air con. - upstairs air con in second room started to leak. Was blocked - felt like the air con could do with a regular service- once again Natalie helped get this sorted quickly. - the room with single beds had a short bed and a camp bed - not two proper singles. My youngest stayed in that room and it was a bit short for her. My two eldest shared the double bed. - only had 4 sun beds 2 sorts -2 were broken. Would be worth investing in 6 new ones! - kitchen was okay but had been cheaply 'revamped' a few doors were re varnished in non matching varnish. - shower walls were a bit dirty - but bleach sorted them. Non of the above spoilt our holiday BUT I would be nervous booking this in a years time as it does need regular investment to keep it in good condition, which does not appear to be done. The nearest secluded beach is a 2 minute walk. This is a pebble beach, with a sandy beach available a further 5 min walk along the beautiful headland, or around the shoreline. Plenty of other beaches are accessible by short drive. There is also a large beach and marina in Larnaca 15 mins drive from the villa. The nearest airport is Larnaca, just a 10 min drive from Blue Serenity. Car hire is not necessary if planning a truly relaxing holiday by the pool and strolling on the beach. If you would like to get out and explore the island a little then car hire is recommended. This can be arranged in advance from a variety of companies at the airport, or on a daily basis from a local company in Pervolia which can be arranged by our managing agent who will meet you on arrival. The nearest mini-market shop stocking all your basic requirements from milk and cereal to charcoal and wine, is a 3 minute drive/10 minute walk from the villa. The centre of Pervolia with its tavernas and shops is 1.5 miles away, so a very short drive or leisurely stroll. A wider selection of shops, bars and restaurants is available 7 miles away in Larnaca. Our management company are on call 24/7 for you convenience. Booking Notes: A provisional booking may be made by email or telephone. This will be held for 7 days to allow receipt of a 25% non-refundable deposit to be made by cheque or BACS. The balance payment is to be made by cheque or BACS a minimum of 8 weeks prior to the start of the holiday. A refundable breakages/damages deposit of £250 is required with all bookings, payable before arrival and refunded within 2 weeks of departure, less any deductions for losses, damage or breakages. Changeover Day: Arrival/departure days are flexible. Generally arrival is from 4pm and departure at 11am, but this may be flexible depending on arrival of following guests.